Cheese is not just thickened, condensed milk but rather it is a fermented milk product. Even those who are lactose intolerant can eat cheese because as it's made the amount of lactose is reduced so there is very little left in the final product. In addition, milk proteins are broken down and made more easy to digest. Children as young as 6 months who are starting solids can begin eating cheese if you're careful about what's in the brand you buy. Try to buy cheese that contains as few ingredients as possible. You don't want a lot of starchy fillers and thickeners. Just remember, the fewer ingredients the better -- just milk, salt and enzymes are best -- but if there is a small amount of annatto for color, this is better than a lot of artificial ingredients. You also want to make sure the cheese you choose is made from pasteurized milk products to avoid possibly harmful bacteria that can cause illness (like listeria). Harder cheeses (like Swiss or Parmesan) are also less likely to carry a risk of listeria contamination. In addition, your child needs all the fat dairy can offer right now, so go for full-fat cheeses. Luckily, these aren't too hard to find. Make sure you grate or crumble the cheese into pieces that will not cause choking rather than cutting it into large square chunks. Melting cheese onto toast or a tortilla and then cutting it up is also a toddler favorite. If you've gotten the go ahead to start on milk and your child has been drinking a cow's milk formula, then you probably already know that your child doesn't have a milk allergy. 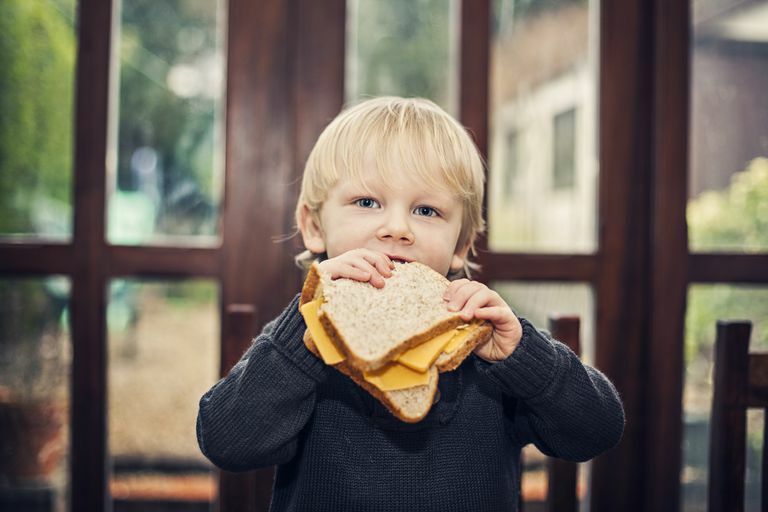 Still, milk is not the only ingredient in cheese that your child could possibly react to. Also, children who have been exclusively breastfed or have been using a formula made with something other than cow's milk should watch for the signs of an allergic reaction, too. Those signs can include: hives, difficulty breathing or asthma symptoms, swelling of the mouth or throat, vomiting or diarrhea and loss of consciousness. Know how to respond if your child exhibits any of these symptoms and be ready to call 9-1-1 immediately.